Domestic workers, or Pembantu Rumah Tangga (PRT) in Bahasa, can be described as individuals who work for private households to undertake such tasks as cleaning the house, cooking, washing and ironing clothes and taking care of children, elderly or sick members of a family. They are generally viewed among the most vulnerable groups of workers: they often face low wages, excessively long hours, have no guaranteed weekly day of rest and at times are vulnerable to physical, mental and sexual abuse or restrictions on freedom of movement. The total population of DWs worldwide has been estimated as at least 53 million. This total did not include child DWs. Graph 1 illustrates that DWs were mostly found in Latin America and Asia (including Indonesia). This article aims to discuss briefly the estimates of the total population of DWs in Indonesia and their basic characteristics. Before coming to these topics, for clarity, auxiliary information on definition and data sources of DWs is inserted as follows. As stipulated in the Article 1 of ILO Convention 189 on Decent Work for Domestic Workers, the term domestic worker (DW) refers to any person engaged in domestic work –work performed in or for a household or households– within employment relationships. According to the ISIC system, domestic work belongs to category “Activities of private households as employers of domestic staff” coed 9700. DW may be residing in the household of the employer or living in his or her own residence. While the first case is known as live-in DW (IDW); the second, live-out DW (ODW). In Indonesia, the National Labour Force Survey or Survey Angkatan Kerja Nasional (Sakernas) and the National Social and Economic Survey or Survei Sosial Ekonomi Nasional (Susenas) can provide statistical data on live-in DW through “the relationship with the head of household”. One of the items of the variable is pembantu (code 8), which is not other than DW as defined above. Sakernas can also provide data on live-out DWs through variable “main industry”. Sakernas uses an open question on that variable and the ISIC system is used for coding. As mentioned, DW can be identified if the code is 9700. 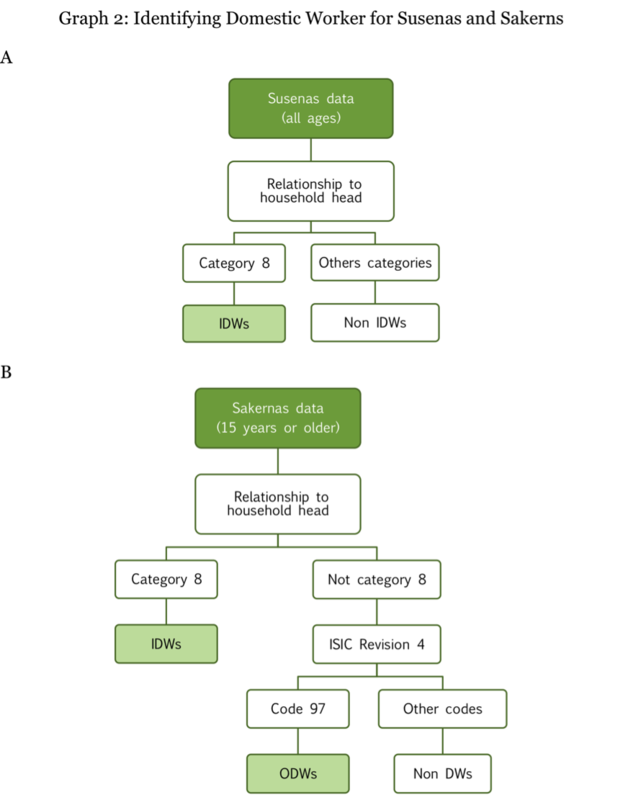 In order to identify live-out DW, the variable is obviously should be cross-checked with variable “the relationship with the head of household”: live-out DW is identified if the code of the variable is not 8; otherwise, live-in DWs. Susenas cannot provide data on live-out DW as the survey uses a close question of the variable of main industry only for a major branch of an economy (cannot be used identify live-out DW). Graph 2 shows how to identify DW from Susenas and Sakernas: Panel A for Susenas and Panel B for Sakernas. 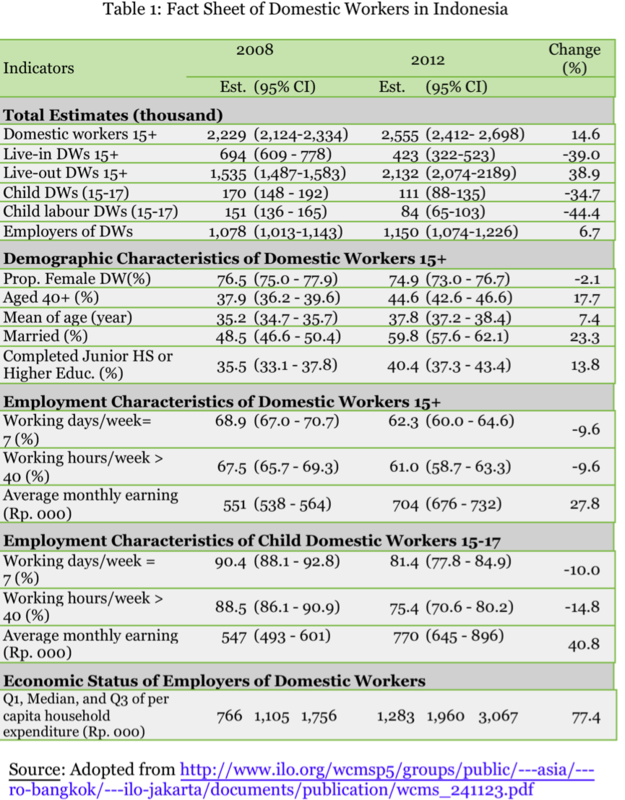 Table 1 shows that according to Sakernas, the total estimate of domestic workers (DWs) aged 15+ in 2008 was about 2.2 million, within 2.1 and 2.3 million of 95 percent confidence interval. The estimate becomes 2.6 million in 2012 or increased by about 15 percent during 2008-2012 periods. The estimates were highly reliable as measured by their relative standard errors that were less than 3 percent in both years (not shown in the table). DWs and child DWs shared the same low level of earning. The last panel of Table 1 shows a high economic status of EDWs as measured by per capita expenditure. In 2008, the median per capita expenditure/month of EDWs was about Rp. 1.1 million. This means, 50 percent of EDWs had per capita expenditure Rp. 1.1 million or more. In 2012 the median was even higher, almost Rp 2.0 million.